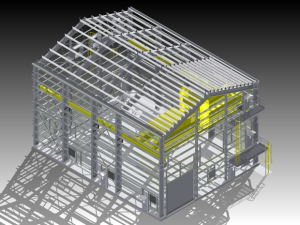 Rigid Frame buildings are constructed with a skeletal primary structural steel design to carry the structural loading of the building. They are purpose built structures with a variety of wall and roof systems to meet a wide range of unique project requirements. Rigid frame buildings can incorporate internal bridge cranes and can even be designed to be blast resistant. With a rigid frame building design, size is not a factor. MakLoc’s engineering and drafting team are well versed with all shapes and sizes of rigid frame design, and through collaboration with our clients, can ensure each building is designed to meet the projects unique requirements. Our estimating and project management teams are fluent industry standards and will ensure the most cost effective and safe design is proposed at bid stage. 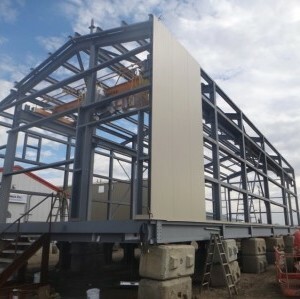 When field construction is required, rest assured our building erection teams are highly skilled and familiar with the unique challenges presented our Northern climate. When yard erected, rigid frame buildings are only limited in size by local shipping restrictions. 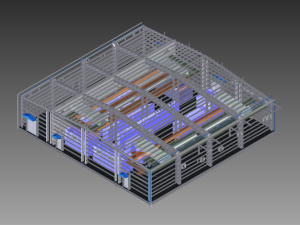 MakLoc works either directly with end users or engineering firms to understand the project requirements and develop custom rigid frame buildings for each individual need. Our full service turnkey operation allows us to support a complete design build process including transportation and assembly on site. As an Alberta based organization, we understand the harshness of Canadian winters and the unpredictable nature of our weather. We started building modular steel structures to support industry need for a building that resists the cold, the heat and the humidity. All of our structures use a continuous weathertight membrane and we design and engineer each building to hold against wind and snow load. Even sound reduction is taken into consideration, understanding that many of our customers work in loud environments. MakLoc works either directly with end users or engineering firms to understand the project requirments and develop custom rigid frame buildings for each individual need.